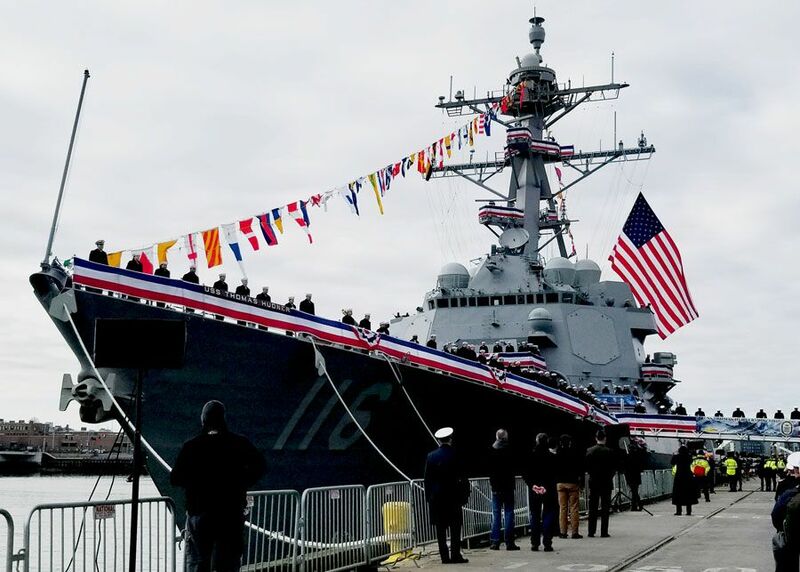 South Boston, Mass.-- Thousands of people packed the Raymond L. Flynn Black Falcon Terminal in South Boston for the commissioning ceremony of the USS Thomas Hudner on Saturday.The Navy’s blue and gold adorned the archway of the terminal while silver and red dotted the crowd. More than 100 members of the CM community including students, faculty, administrators, alumni, and current parents attended the special ceremony. 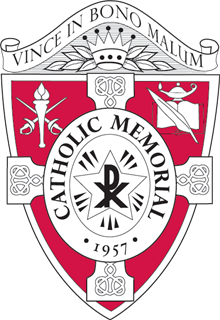 Mr. Thomas Hennessey ’66 served as the Chair of the Commissioning Committee and provided the tickets to CM. The commissioning served as the culmination of a series of events related to Thomas Hudner for CM’s juniors. “The Commissioning Ceremony represented a lesson on democracy and citizen sailors, and it was great to see the families of colleagues, students, and alums take part in this event. I think it's important for our students to understand and respect the men and women who choose to serve our country and maintain peace and open seas,” said Mr. Vincent Bradley, Chair of CM’s History and Social Studies Department. The commissioning ceremony is a naval tradition which harkens back to the days of John Paul Jones. Representative Stephen Lynch, General Joseph Dunford (Chairman of the Joint Chiefs of Staff), Mr. Richard V. Spencer (Secretary of the Navy), and Mayor Marty Walsh spoke about Thomas Hudner and military service. They also talked about the contribution of Bath Ironworks, which constructed the ship, to naval history. Governor Charlie Baker delivered the keynote address and recalled his personal interactions with Tom Hudner. During the ceremony, the ship’s first crew, known as plank owners, manned the ship and brought it to life. "My experience at the USS Hudner commissioning ceremony was amazing. It completely changed the way I looked at the Navy forever. Inside the ship was breathtaking," said freshman Charlie Leahy who attended Saturday’s ceremony. The story of Thomas Hudner has been a focal point of CM’s junior class this school year. The juniors read Devotion by Adam Makos which chronicles Thomas Hudner’s valiant efforts to save his friend Jesse Brown during the Korean War. For his efforts, Hudner was the recipient of the Medal of Honor. Makos’ book not only chronicles Hudner’s heroism on December 4, 1950, but also tells the story of the deep and abiding friendship between Hudner and Brown, the first African-American naval aviator. “For [Hudner] to risk his own life and not think about the implications of his actions to his own safety, says a lot about him as an aviator and as a person. His only thought was to save his wing man,” said junior Will Fleck. Last month, Hennessey, who oversaw the planning of the ceremony, visited his alma mater. While there, he spoke to the junior class about Hudner and the construction of the new naval guided missile destroyer. Following Hennessey’s visit, the junior class made the trek to South Boston and toured the ship with members of her crew. The CM students were among the first of the general public to set foot on the deck of the Hudner. "The story of Thomas Hudner represents our history program'sintent to focus the student experience on scholarship, character and engagement.Through reading Devotion, taking part in a talk by Thomas Hennessey and participating in a field study to tour the USS Thomas Hudner, students experienced first-hand Medal of honor recipient Tom Hudner's example of quiet bravery and heroism," added Mr. Bradley. Over the last several years, the History and Social Studies Department has undertaken a concerted effort to bring history to life with a series of lectures, experiential learning, and field studies.